Nice tea pot, but the color was not as vivid as pictured. The red was more of a rust color and the gold was barely visible. The service by Enjoyable Tea was outstanding. Easy return. Pros: fast shipping, beautifully gift wrapped, good quality. Cons: Much darker color than expected, barely any trace of gold color. Color was really disappointing. Having recently purchased cast Iron coated cookware and liking the manner in which it hold heat and cooks food, I wanted to try the concept on a tea set. When I found this at Enjoying Tea, I wanted to try it. It is very well made and does what I expected. I holds the heat very well. It looks very nice and has great detail. My wife will thoroughly enjoy it. Ordering and delivery was simple and easy. The website was easy to navigate. This transaction was easy and painless. My cup runneth over! 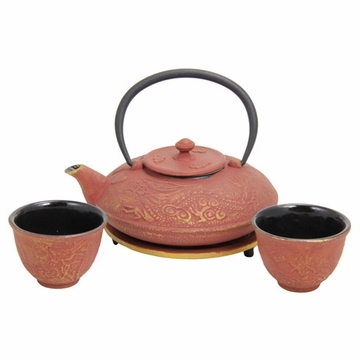 This ornate cast iron tea set is perfect for making and truly enjoying many cups of tea! My father's best friend in Germany had a pot like this, and my cousin has one as well, so I decided to add another teapot to my collection. Yes the cups become hot, but it makes sense, as they are made out of cast iron. I usually pour into smallish mugs and can get two mug fulls out of this pot. 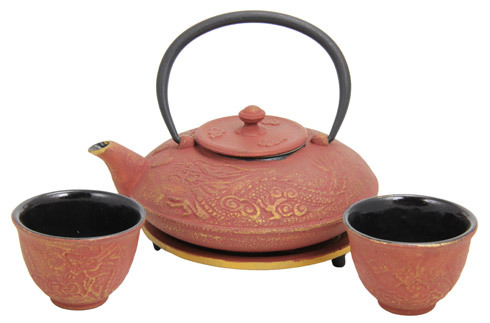 The design is beautiful and the pot is effective for using loose tea, which I have quite a lot of. The whole set looks great and the teapot is my favorite one but the cups get too hot to use! It is not a red color as pictured but more brownish which is the main reason I ordered from this company. I wish the tea strainer would descend lower into the pot without having to fill it so much with the water. I do love how the cast iron keeps the tea warmer longer and I can pre warm the cups while steeping the tea. Beautiful set. Prettier than pictured. Received my tea set today! Very beautiful and elegant. It is not as orange as I though it would be which I like, more gorgeous in person. I also order the warmer and additional 2 more matching tea cup. It came on time and best of all they email me a confirmation stating they had deliver!! I though that was great of them to let me know, I would definately order from Enjoytea again.